St. Vincent and the Grenadines are one country. 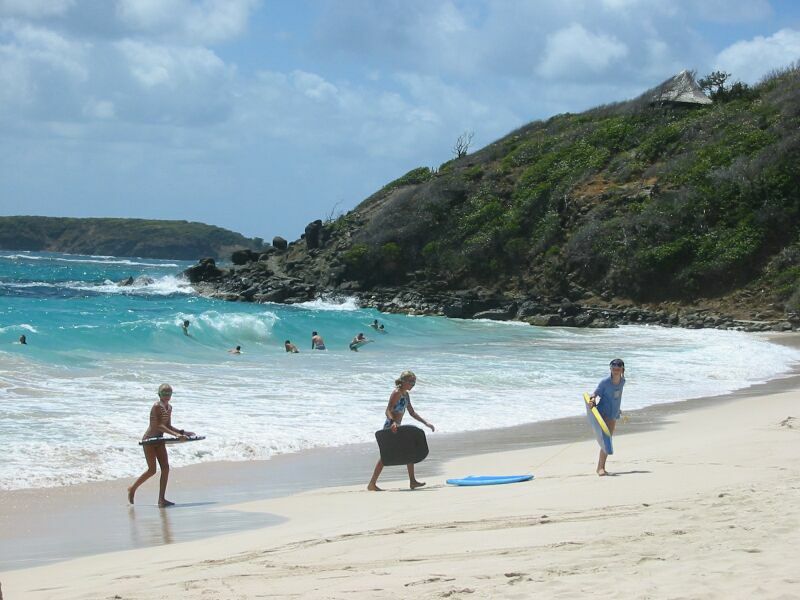 Another British West Indies country, the capital is located on the main island of St. Vincent. We reviewed the collection of tourist sights at St. Vincent and the Grenadines and decided St. Vincent was largely similar to the other islands we had been visiting, while the Grenadines were a collection of unique smaller islands located just a few miles apart. 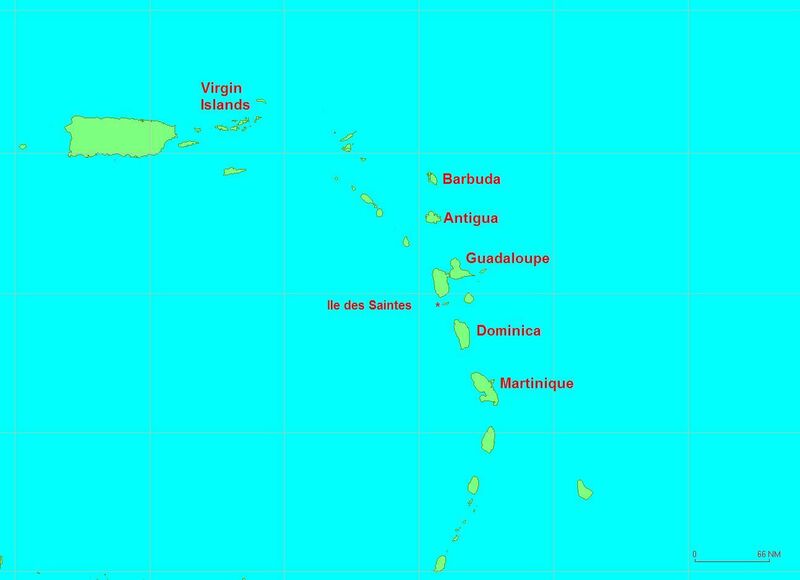 Given our schedule, we decided to concentrate on the Grenadines this time, and if time permits stop by St. Vincent later. 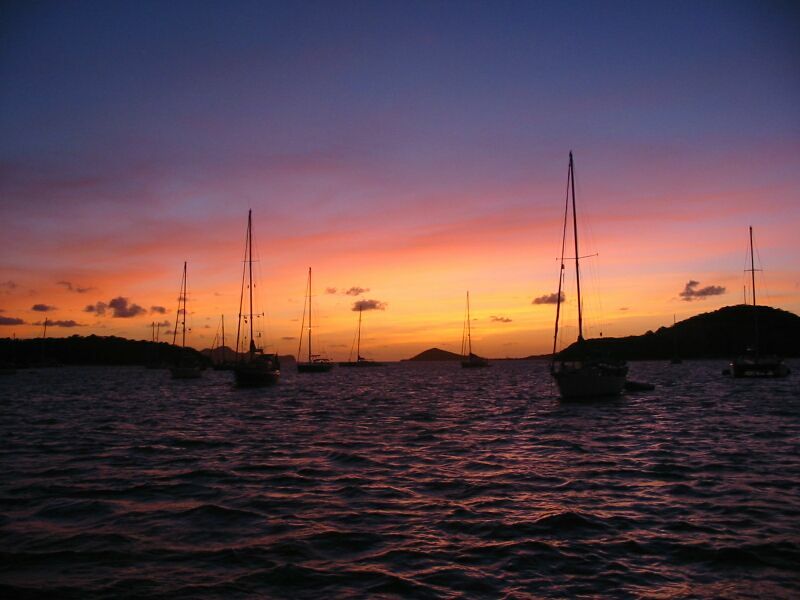 The first island, on the north side of the Grenadines, is Bequia. 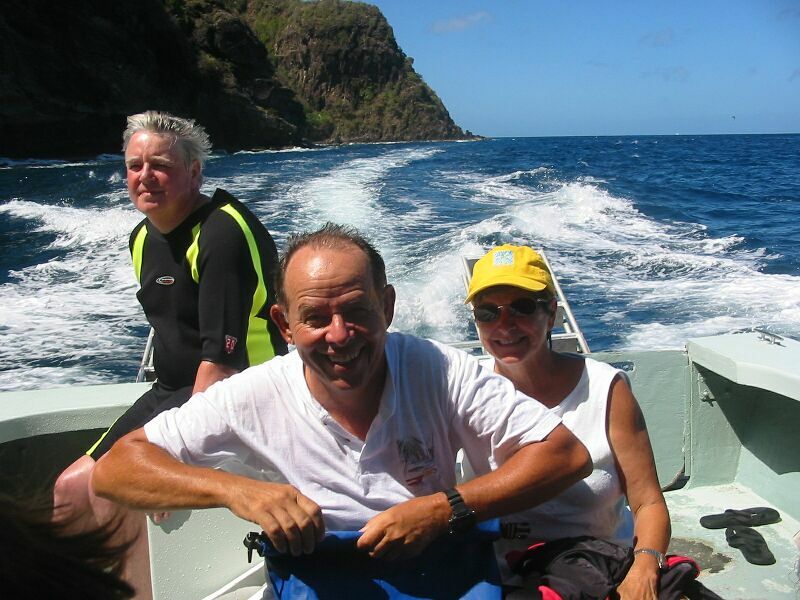 Bequia is just south of St. Vincent, so when we left Marigot Bay, St. Lucia on March 6th, our destination was Bequia. 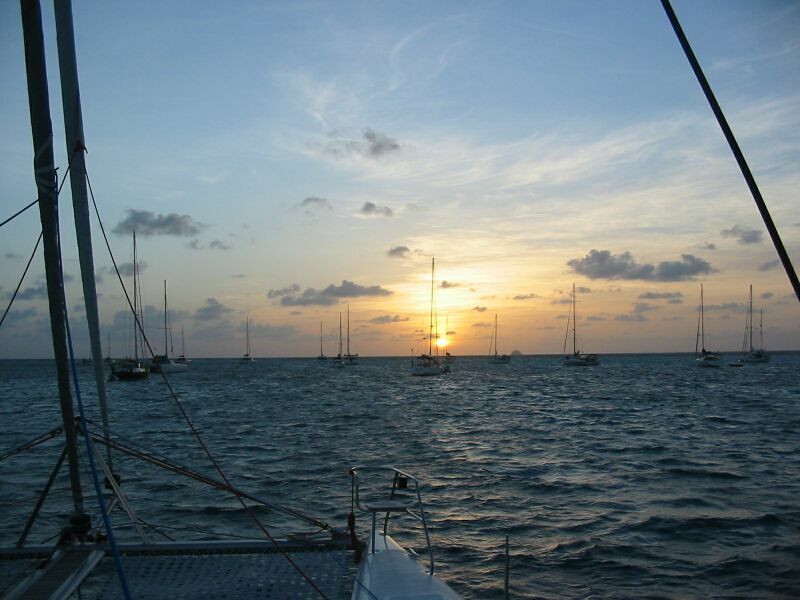 We had a nice sail from St. Lucia to Bequia with an interesting surprise along the way. Since we were travelling southwest now, the winds were more from behind now, so the sailing was a much more pleasant feel than most of our trip where we were going more upwind. Downwind sailing is usually faster, and smoother. We left Marigot Bay on Thursday, March 6th in St. Lucia at 6:00 AM sharp - as this would be a longer trip than usual. We had to motor along the protected coast until we got close enough to the southern end to pick up some wind. We had plenty of wind and a few rain squalls along the way. We averaged about 8 knots through the water, but a bit less actually covered over ground due to some northerly current. As we crossed towards St. Vincent, we noticed a couple of other boats headed the same way. We got closer and passed one of them, the other boat took us quite a while to catch up with. It turned out to be a catamaran - i.e. a quicker boat than the usual monohull. Here's a shot of St. Vincent, and a shot of Cajun Wind II - also a Lagoon 41 like Hotel California. 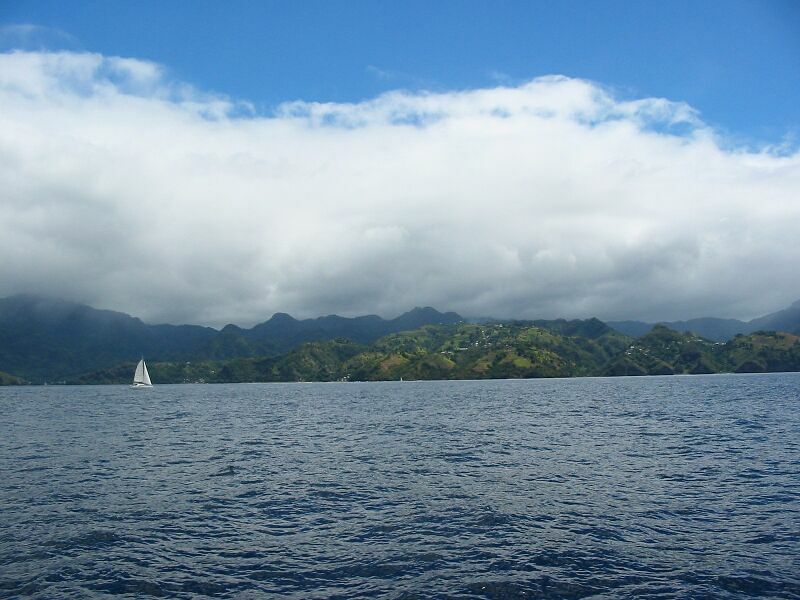 We continued our sail, with a few miles of motoring, down the protected side of St. Vincent. 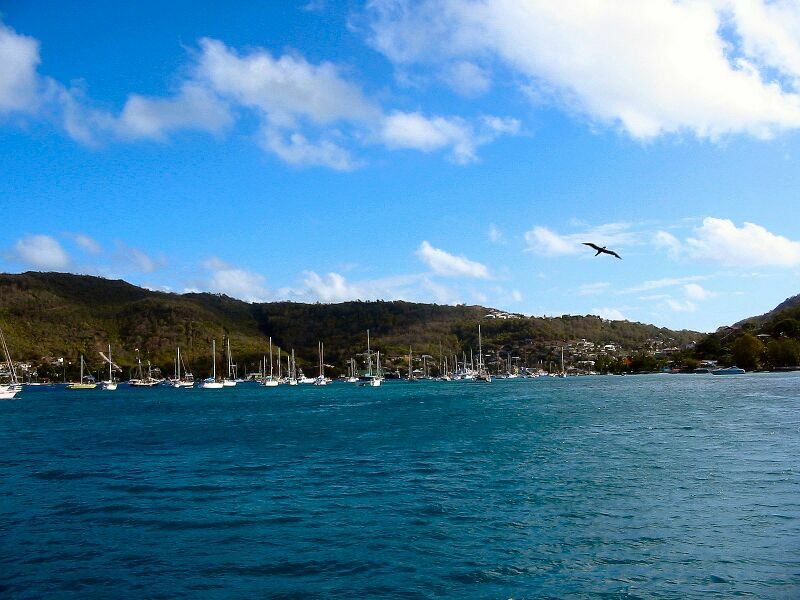 Once past the southern end we began crossing to Bequia. The winds started picking up quite a bit, so we quickly double-reefed. It was a good decision as the winds built to over 30 knots apparent. 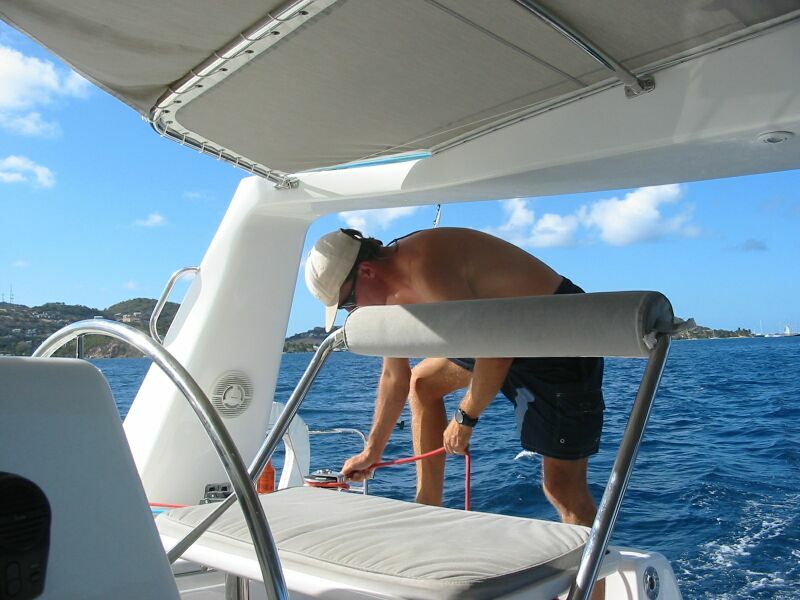 We needed to get tight into the wind because Bequia is a bit south east from the southwest tip of St. Vincent. But, with the strong winds we still made good speed. Later, Cajun Wind explained the winds are often stronger between St. Vincent and Bequia. As we approached Bequia, but still with some sloppy seas, we noticed a strange sight - a guy standing up in a dinghy with a rope to hold him up was in our path. As we got closer, he started motoring towards us. Suddenly he started pointing a plastic bag towards us. As he got closer, Frank suddenly realized he was taking pictures of us. He circled around taking pictures. This was real entrepreneuring. Karen noted she had read about this guy in the guidebook. The next day he showed up with samples of the pictures and prices. 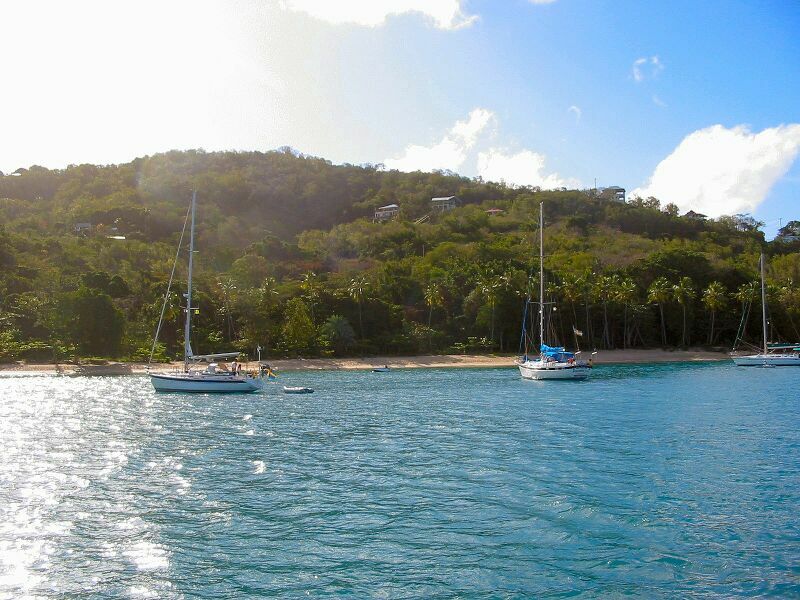 We finally came into Admiralty Bay, Bequia and dropped anchor. We arrived at about 2:30 PM after sailing 68 miles - we averaged nearly 8 knots - not bad considering the counter current of 1 - 2 knots we had most of the way. 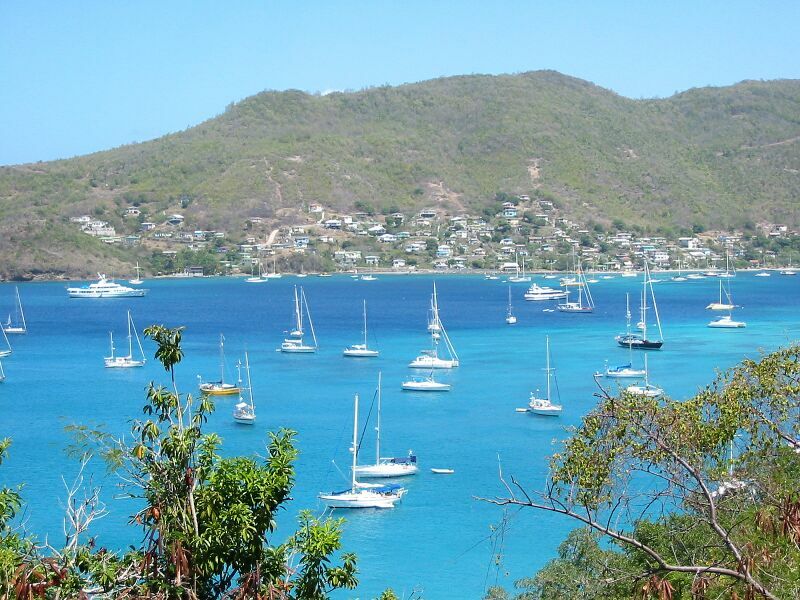 Bequia is a popular stop with cruising sailors. Admiralty Bay is a well protected bay, has a wonderful customs/immigration building, and the locals cater to cruisers with appropriate services such as: chandleries, fishing supplies, a bookstore, Internet cafes, groceries, bars, plenty of dinghy docks, restaurants, dive shops, etc. All of this on an island much smaller than one would normally expect with such services. 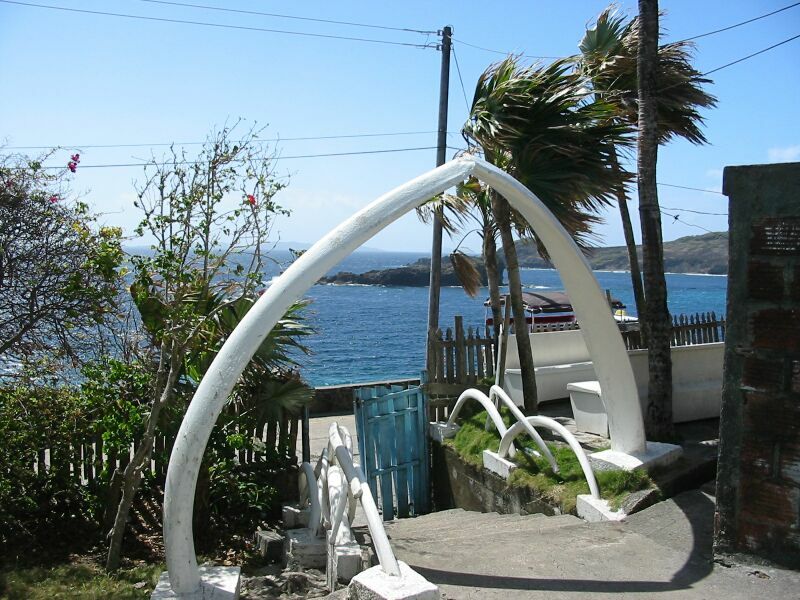 The local people on Bequia are a close-knit group of people tied to the sea who are well known in the area because of their heridity as whalers. They are one of the few places in the world which are still allowed to hunt whales - albeit with a very small limit of only 4 whales per year. After our arrival, Frank went in the dinghy over to Cajun Wind and picked up our friend Ken. They went ashore and entered in customs. Frank was surprised when customs charged a $7EC per person per day fee for 7 days or more of stay in the Grenadines. This gave the Grenadines the unique characteristic of being the most expensive to enter in the East Caribbean. All total, our fees were $140 EC - or about $56. Just a bit higher than Antigua, but significant. Post visit analysis would determine whether it was worth it. We agreed to meet with Cajun Wind later for the dinner. We went over to their boat around 6:30. Cajun Wind's friends, who we had also met in Deshaies, Mike and Dinah from the UK were there as well. We all went ashore a few minutes later and found the right dinghy dock for the restaurant with the BBQ. Only, we discovered they were sold out! So, we walked down the beach and went to another restaurant. We had a nice meal and a relaxing time with our friends. On Friday, we spent the day doing home schooling and relaxing on the boat. During the day, Cajun Wind invited us to go on a single dive the next morning - at only $35US/per person, we thought it sounded great. So, the next morning the dive boat came up at 10:00 directly to our boat and picked us up with our gear and we headed to the north side of Bequia. There we did a nice shallow drift dive (where you just let the current take you) along a reef. It was beautiful conditions, and because it was shallow we were able to stay in the water a long time. Although, even with wet suits, one of the girls had to get out because she was cold. Here are some pictures from the dive trip. First, a shot of Ken and Jo Ann of Cajun Wind; next the girls underwater; and just a couple of the many beautiful sites under water here. The next morning, Frank finished writing web pages for Martinique and St. Lucia, and went ashore to the Internet cafe to upload it. Unfortunately, the only cafe open on Sundays did not allow laptops. As a result, it took a while to upload the web site, but he got it done. We had a little rain squall and lots of threatening clouds come through during the day, so we decided to postpone our taxi tour of the island until the next day. We spent part of the day cleaning up the boat, anticipating inviting Cajun Wind over later. Only Cajun Wind left the bay in the afternoon to sail to another island. Oh well, at least the boat was cleaner. On Monday we went ashore first thing, got some cash, and found a taxi driver. It was a perfectly clear day, perfect for our tour. Our driver was named Ellsworth, and he was a nice gentleman with some east Indian descent - but clearly a native local with his accent. His most unique characteristic was his habit of shouting out (he was in the front cab, and we were in the back of his pickup truck with a roof over our heads, open sides, and cushioned seats) and pointing to houses saying "American", "Canadian", "French", "German". He seemed to enjoy pointing out the international residents of the island. We went first to the whaling museum, where we met the nephew of a famous whaler who showed us the small museum and told us some whale tales (some of them appeared to be a whale OF a tale). He was an old man, retired from whaling, also of east Indian descent. Apparently, he is part of a large family of whalers who have dominated whaling for over a hundred years there. His uncle was famous for having harpooned a whale with a single harpoon, and also for having caught the largest whale in their history. 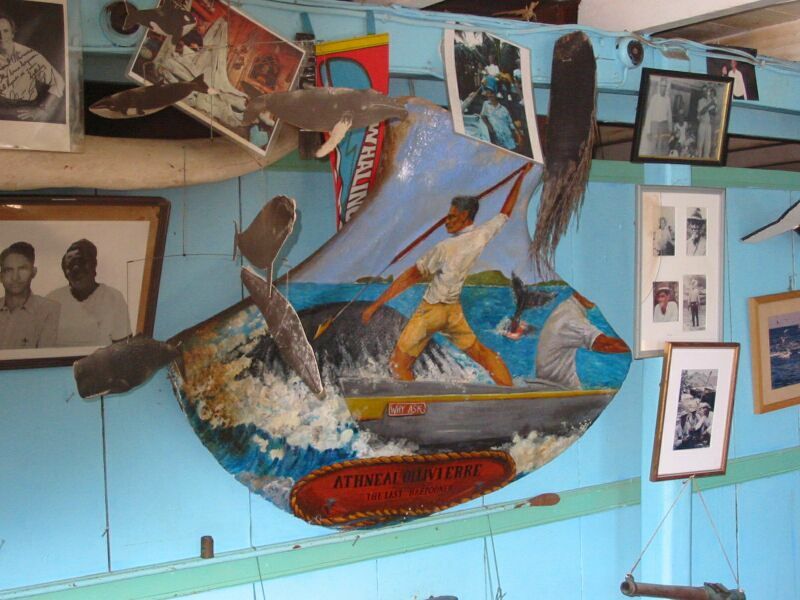 There were pictures of Clint Eastwood and Tom Cruise on the wall, and he claimed to be in touch with them regularly when they came down to dive in the Grenadines. We next went to a fishing village and saw lobsters, a few fresh caught fish, and some cool sailboat models (about 4 feet in length) that the locals race. They have no controls for steering, so they have to physically turn them to tack, but they enjoy racing them on a regular basis. We saw the airport built on reclaimed land on the south side of the island. Then we went along the beautiful beaches and bays on the east side of the island. We also went to the highest point on the island and around an area of mountain pastures with cattle. We noticed the terrain seemed similar to areas in West Virginia and Tennessee, and in fact our taxi driver told us there was a family living there from Tennessee. 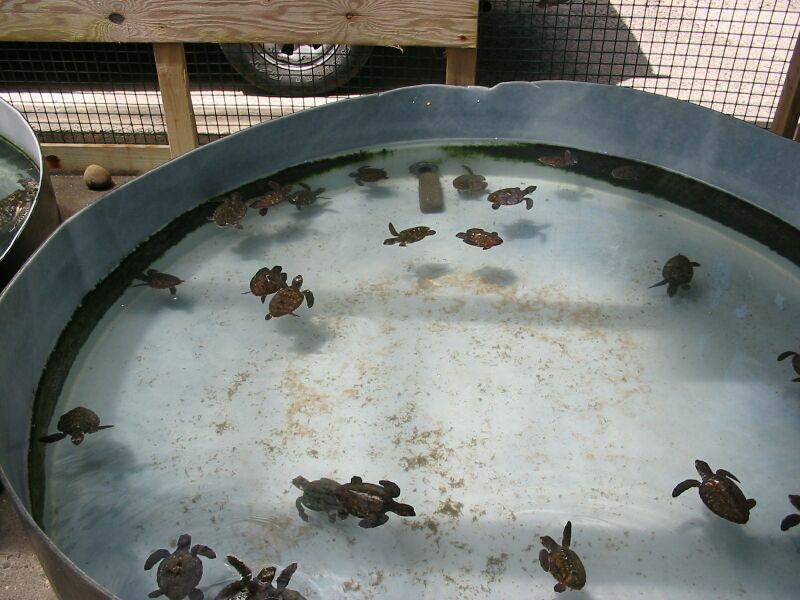 Finally, we went to a famous turtle sanctuary on the north east side. The gentleman there, who started and runs the place, proudly showed us his efforts. 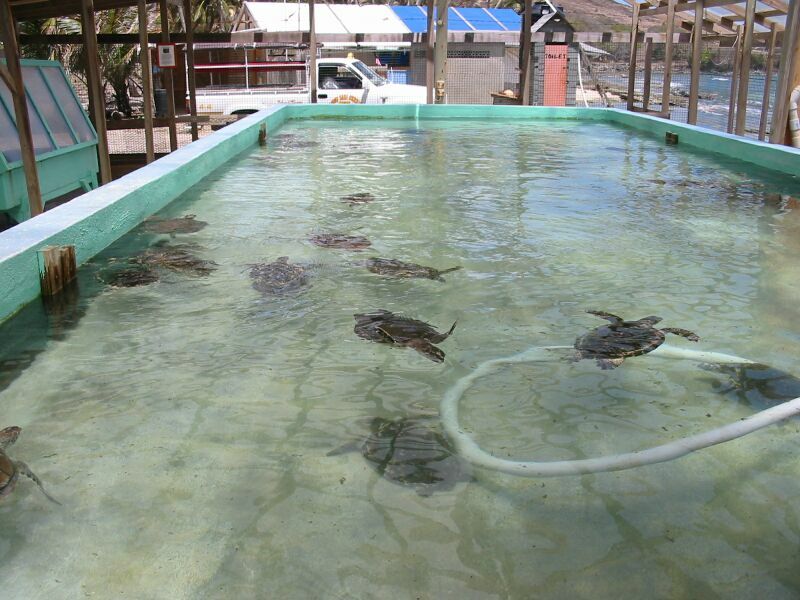 He helps raise 250-500 turtles per year and returns them to sea after they are about three years old. His efforts are completely funded by visitor donations, and we gladly made a donation while we were there. It was obvious he really cares for the turtles and has made efforts with the Caribbean governments to get people to respect turtle hunting seasons to allow more to survive. After our tour, Karen went ashore to do some provisioning. Frank went to pick her up later, and found she had made "lifelong" friends with some of the locals at the market there (after her enormous purchase). Really, he heard the guy say to her they were "friends, lifelong friends!". We planned to leave the same day for Mustique. 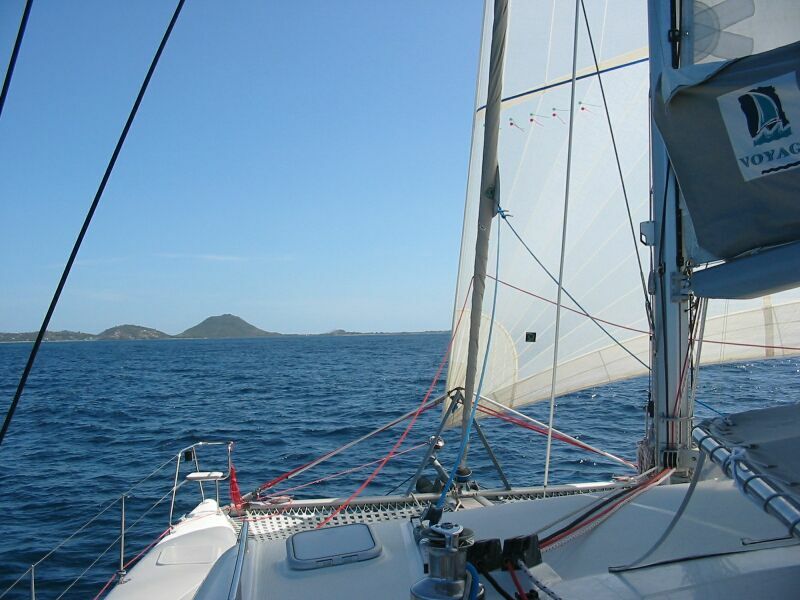 We weighed anchor at 3:30, raised sail, and tacked our way to the south east over to Mustique about 17 miles away. We arrived just before sunset, and picked up a mooring. We were shortly visited by the locals who collected mooring fees. They gave us a nice quick overview of the island and left us to get settled. We had a quick dinner and retired early as we were beat from the busy day. 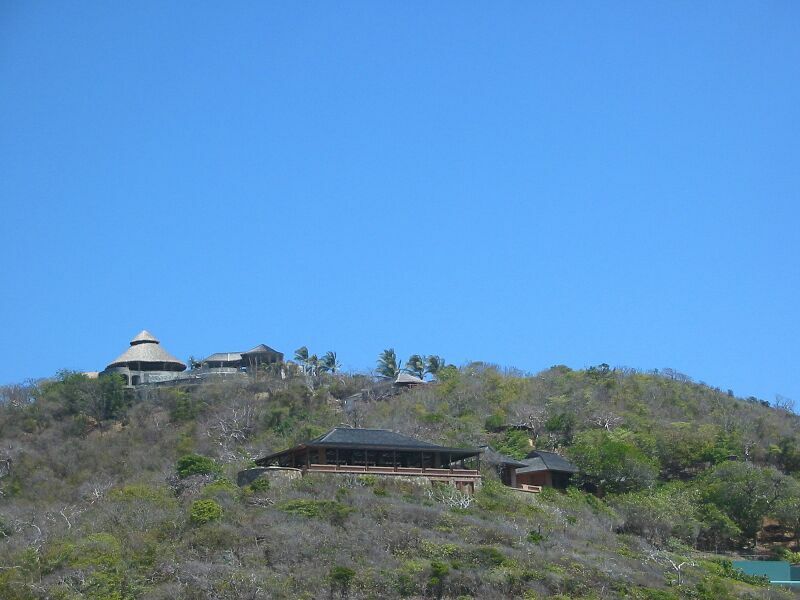 Mustique is a privately owned island and caters to the rich and famous. They have beautiful large houses located throughout the island which are rented to single or multiple families visiting the area. Some of the houses are privately owned, and some of the "houses" are actually palaces. One in particularly was definitely a palace. We were overdue for home schooling, so our first full day in Mustique we spent on the boat doing home schooling. A bit of swimming and snorkelling as well. Our second day was a near-perfect day. 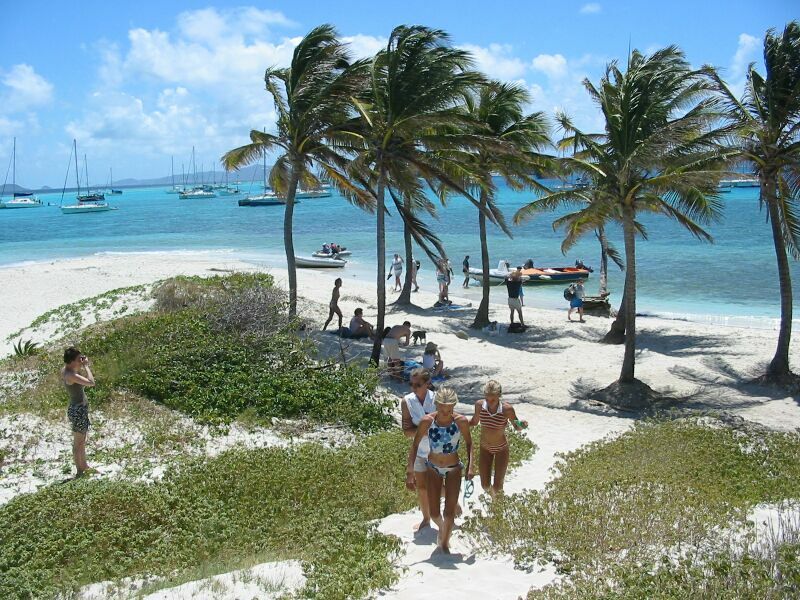 We had read there was a nice beach on the east side of the island, so we got ready and went ashore around 9:30. We went to the dinghy dock, dropped off our trash, and walked to the little bakery nearby. We started walking up over the hills, and as we were walking we were picked up by a nice elderly English couple in one of the standard gas-powered golf carts used on the island. They were regular repeat visitors to the island and they were going for a last chance at the beach before catching a plane out later in the day. So, they drove us straight to Macaroni Beach. This beach is really beautiful. 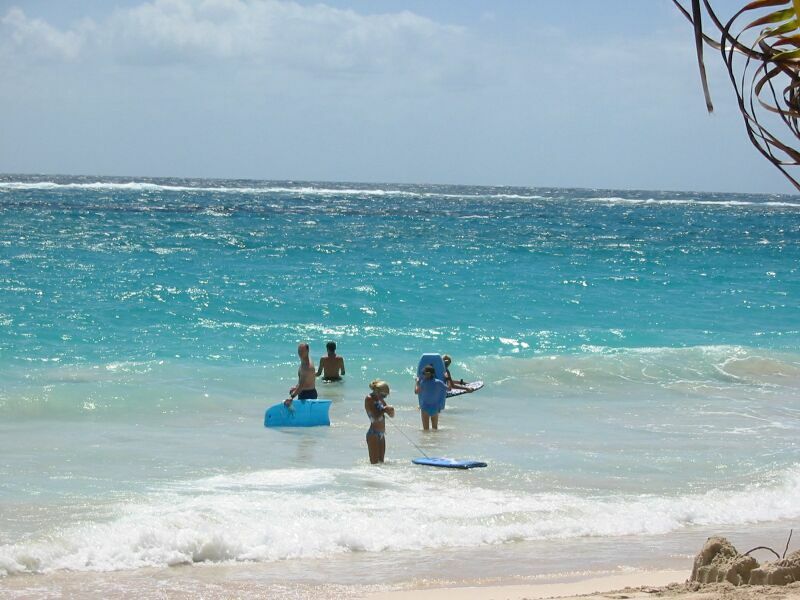 Fabulously soft white sand, and perfect waves which are perfect for body surfing thanks to a set of reefs offshore which ameliorate the normal Atlantic waves. On the beach, were nice palm trees or little covered picnic tables. Karen enjoyed sitting in the shade while Frank and the kids played in the water. It was really great. We started walking back, and then were picked up by one of the many workers who take care of the island, the houses, and services for the customers. He drove us all the way back to the Bay town. Frank noticed there was an advertisement for a BBQ and a Magician coming to the restaurant that same night. So, he suggested we go. This was a popular suggestion - even though dinner wouldn't start until 8:00 and the Magician at 10:00. We waited out on the boat and we all got clean and dressed up. We went ashore to Basil's Restauarant and later realized we were seated in a table near the owner Basil. The food and service were excellent. The girls were anxious to sit in the chairs set up in front of the stage, so we let them go. They ended up next to some kids who were staying on a HUGE sailing yacht in the bay called Rebecca. We found out Rebecca is 131 feet in length. It is a two master with beautiful varnished wood all over the top. The Magician was quite good. He is from Sweden, but speaks very good English. And his act was obviously well practiced and quite good. He practiced good audience participation. Both Patricia and Frank ended up being small parts of the act. He covered all the typical magician trades (illusions, card tricks, rings, balls, hats, water, etc. ), but he did it with flair and was very impressive. All in all, it was really a perfect day. We enjoyed the beach so much, that Frank and the kids got up early and, after taking a Science test, went to the beach again the next day. The girls got quite good at body surfing with a some lessons from their Dad. After lunch we got ready and departed to sail to Canuoun. Canuoun is a slightly larger island located southwest of Mustique. We sailed the 16.5 miles down and arrived at about 2:20 PM. After getting anchored, Frank went ashore to get some money from a bank. He found the resort hotel at the bay had a nice restaurant, and the prices seemed reasonable. So, we went to dinner later that evening. The service was impeccable, and the food excellent. Frank managed to pick up some more old Caribbean Compass newspapers for cruisers. We also found out from the waitress that Elizabeth Smart had been found! The next morning, Frank eventually got through Math with the girls. The girls were not in good moods. We decided there wasn't much to see in Canuoun, so we got ready and headed out for Mayreau and the Tabago Cays. 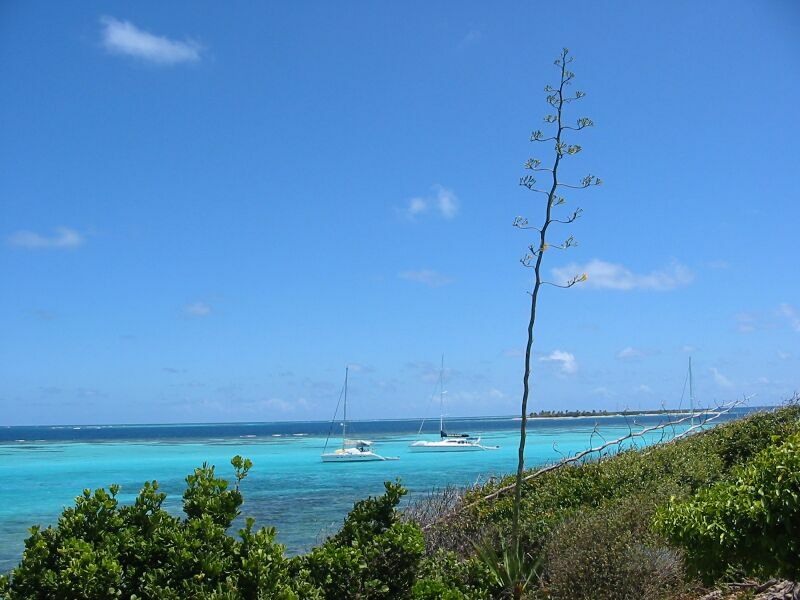 We had a comedy of little errors during our 1 hour trip, but eventually arrived safely in Saline Bay off Mayreau. Karen spent the afternoon doing schoolwork with the girls. Frank did some maintenance including some bottom cleaning. The next day, Frank sent an E-mail to his sister Teresa as it was her birthday. Frank then gave a math test to the girls. A cruise ship showed up and anchored off shore, and we were treated to a barrage of boats coming to take the tourists to various locations. 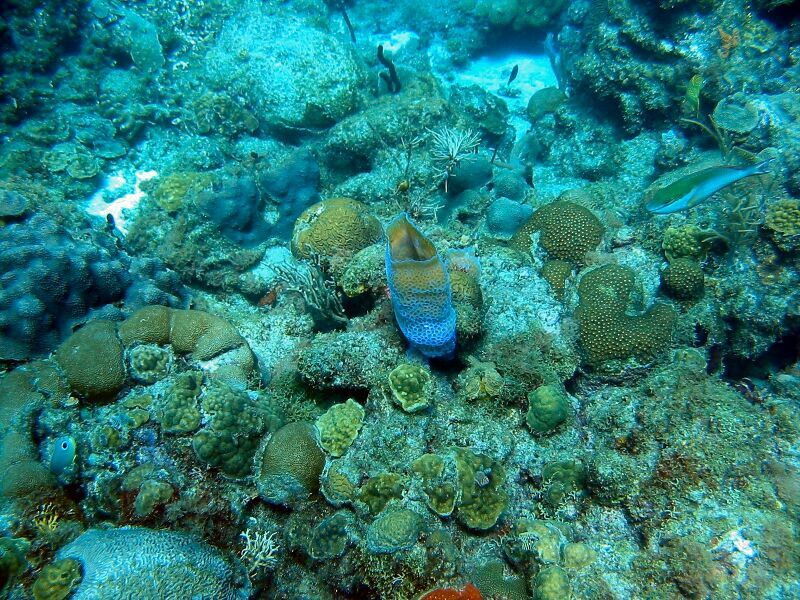 Frank went exploring for some good snorkeling, but decided to come back and have us move to the Tabago Cays. 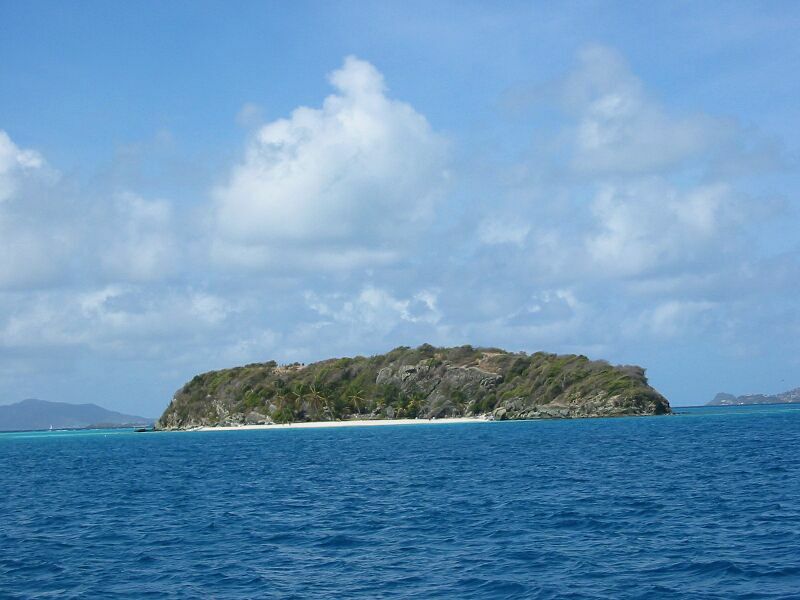 We sailed around the north side of Mayreau and over to Tobago Cays - 6.6 miles. 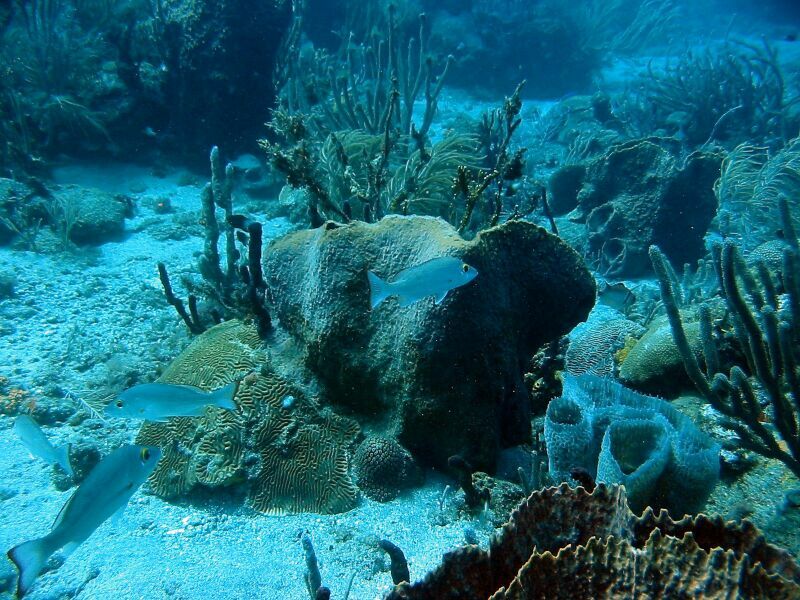 The Horshoe Reefs surrounding the Cays and the resulting shallow waters makes for beautiful turqouise waters. We anchored in the back of the pack - there were a lot of boats here - hanging over deeper waters with our anchor in 13 feet of water. 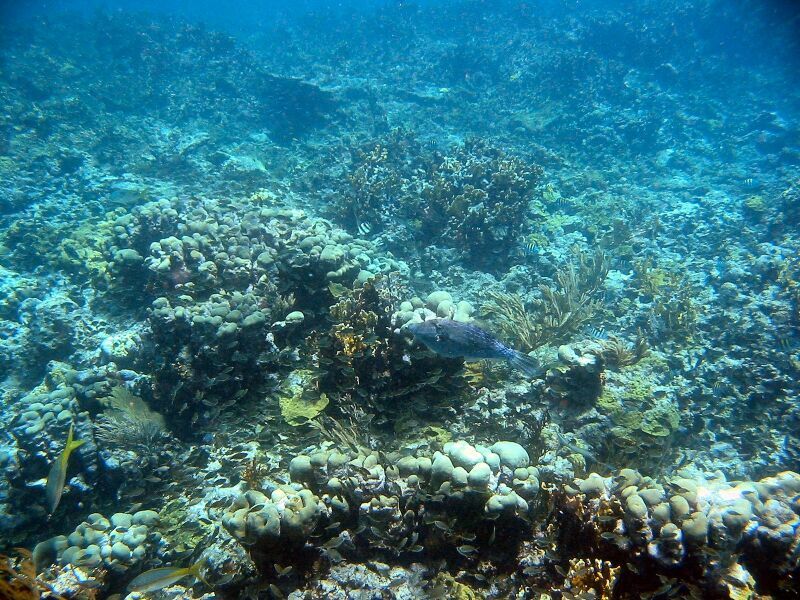 The waters were beautiful, and the reefs everywhere. 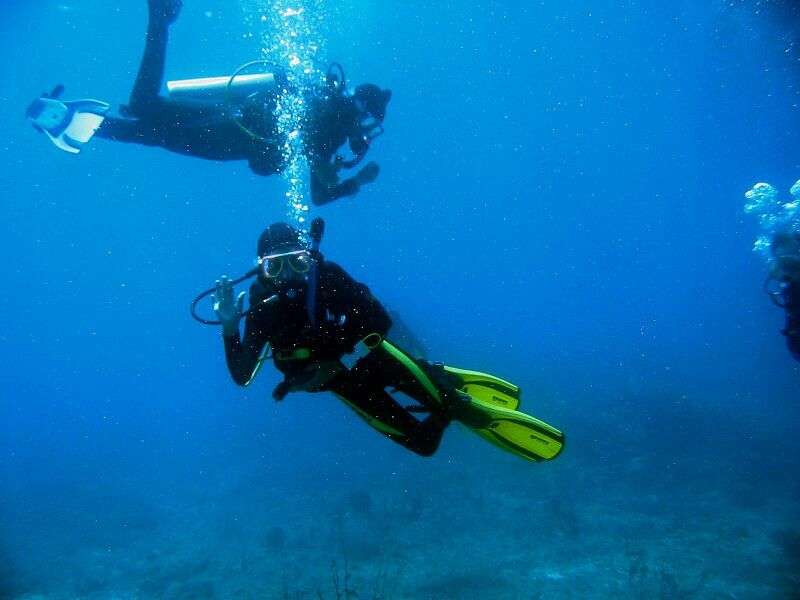 We couldn't resist going snorkeling for long. We found there is quite a current through here when Karen and Frank went snorkeling in the shallow area behind the reef. Unfortunately, the batteries in the camera did not last long enough. We had been watching lots of fish feeding on the remains of a large lobster, when Frank noticed a _LARGE_ fish coming up. At first we thought it was a baraccuda, but it didn't have the right shape to its mouth. It was easily 6-7 feet long and about 7 inches wide. We thought later it may have been a Tarpon. Unfortunately, the camera died then, and so its only a fish story for now. But, Karen - who never lies - will attest to it as its size as it scared her out of her wits. It passed within 4 feet of us - huge. The Tabago Cays are fantastic. The little islands make great places with little white sand beaches and plenty of good little hikes. 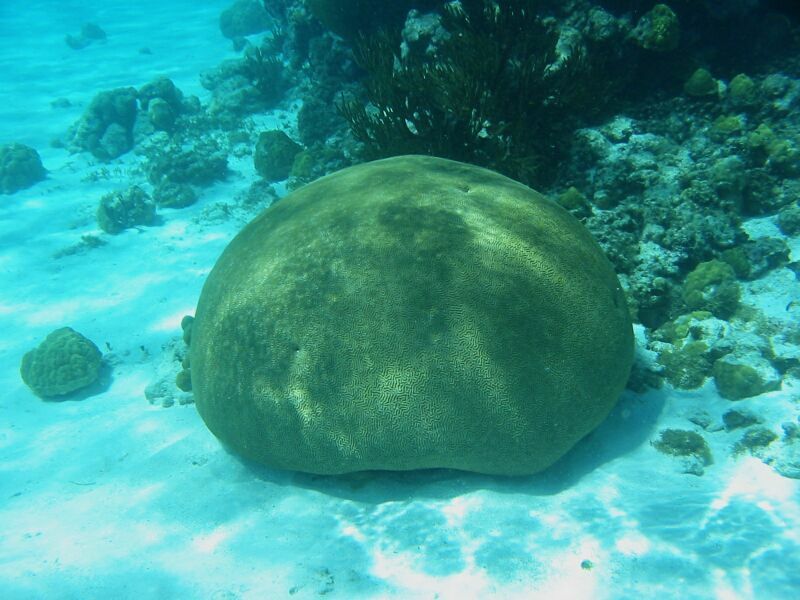 The reefs surround the area with fabulous snorkeling or diving. Its no wonder there are dozens of cruising sailboats there every day. We ended up staying several days here. While in the Tabago Cays, we gave the girls permission to use some paints we bought to paint some decorations in their rooms. So, they began this work. On the second day, we noticed some other boats had some kids on them. The girls went to visit one by kayak, but they were just leaving. Then, Frank sent the girls on the dinghy to a U.S. flagged boat we had seen at Canuoun called Freedom. There were two young girls on board. The girls came back with the two girls, who were visiting Freedom for their spring break - they were from New York. One of the girls was named Catherine, and the other Elizabeth. A few minutes later, the New York girls' mother and the owners of Freedom came over to invite us to go out snorkeling together. They took us to an opening to get to the outside of the reef. 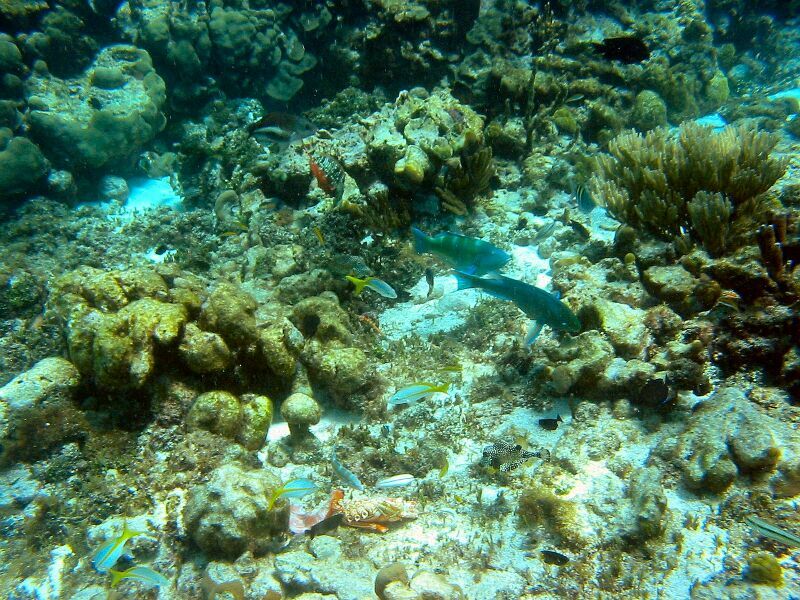 The snorkeling was excellent, and Frank took as many pictures as the batteries would allow. Later we went to a beach on one of the islands. Frank found out the owners of Freedom, Ellen and Gil, had sailed in the Caribbean during the 90s, but now live again in NY City. They work in a business offering financial planning to executives. They have a guy from New Zealand who lives on their boat and takes care of it - and is crew when they come to visit. A nice arrangement. We invited the folks from Freedom to visit on our boat later in the day, and spent the afternoon cleaning up. We showed them the boat and exchanged a few tales between cruisers. It was a nice visit. The next day, Frank discovered one of the cereal boxes we had bought was infested with weevils. So, we spent a while cleaning out the "pantry" where the cereal was located to try and eradicate the pests. We consider ourselves fortunate as this was our first invasion of note. The girls did more swimming with the girls from Freedom, then a while later we pulled up anchor and sailed a short distance over to Union Island to do some provisioning. While there Frank got on the Internet and read the story about Elizabeth Smart being found. We came back later in the afternoon and re-anchored in a better spot this time. We did some swimming and snorkelling again. The next day, we sent the girls over by dinghy to say goodbye to Freedom as they left to go north. We spent another couple of days sailing, home schooling, exploring the islands, snorkeling, and generally having a good time in these beautiful islands. A definite must stop for any cruiser! There was one thing marring a perfect time in Grenada - Karen and Frank were listening on a regular basis to BBC Radio about the possible war in Iraq. Our views on the situation aside, this could very well impact our plans to go to the Mediterranean in May. 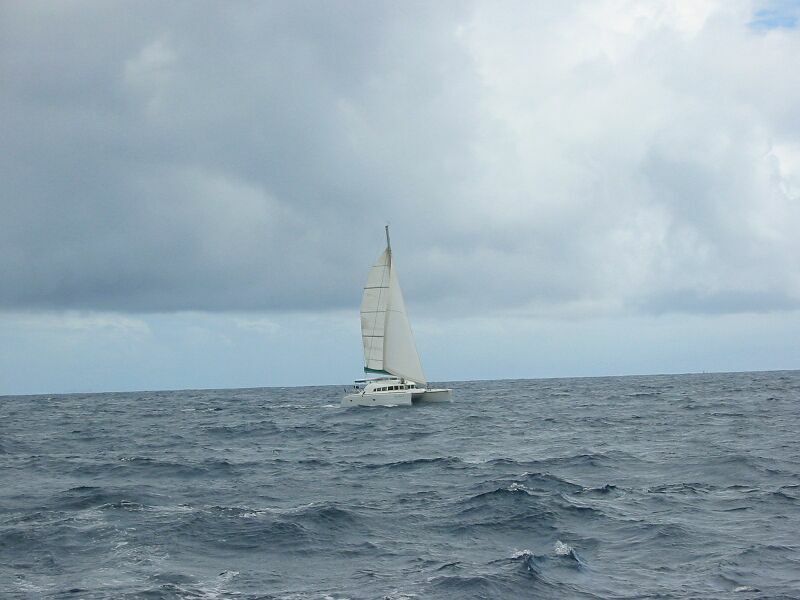 On Wednesday, March 19th we left after lunch and sailed back to Union Island to clear out of customs. Frank did the customs thing, and then picked up a couple more provisions. Then we sailed out of Union Island for Carriacou, Grenada.